No doubt about it: Cradle cap is anything but cute. How to banish it without harsh measures? 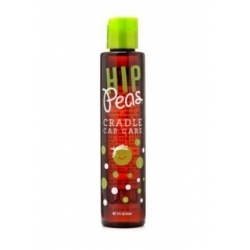 Hip Peas Cradle Cap Care offers an all-natural remedy with olive oil, jojoba oil, sunflower seed oil and vitamin E to soothe and moisturize your bundle of joy’s scalp. Just apply a small amount of this soothing oil, massage and gently brush scalp with a baby brush. Our non-irritating formula adheres to flakes for easier removal, nourishing tender skin as it clears cradle cap. Follow with a gentle shampoo to eliminate excess oil. This product goes perfectly with the Hip Peas Wooden Baby Brush and would be a super baby shower gift for that special mommy to be!